Everyone has a strategic way to eat a chocolate bunny. The ears are good way to start or you could dive right into the tail. 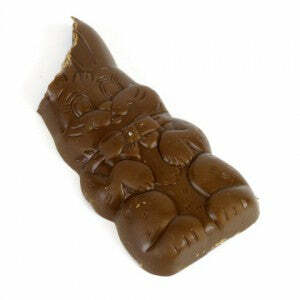 But have you ever stopped and thought, why am I eating a rabbit made out of chocolate in spring? The Easter Bunny can trace its roots all the way back to 17th century Germany, when the holiday hare made its debut in Lutheran Easter celebrations. The hop-along rabbit has traditionally been depicted as bringing colored eggs, candy and even toys to children, the night before Easter. Rabbits and eggs became symbols of the spring time celebration of Easter, as they represent fertility and the bounty of the coming season. By the 1890’s these bountiful bunnies had become widespread in their more delicious (and less fluffy) chocolate form. In 1939 the molding process for most chocolate bunnies was changed making hollow bunnies possible. The hollow bunny has a few advantages over it’s solid cousins. For one they’re just plain easier to eat with less of the tooth cracking density of a solid rabbit, and there’s a bit more whimsy in a giant hollow rabbit versus a more modestly sized solid counterpart. Whether you choose solid or hollow, you can at least flip a coin… start on heads or tails?